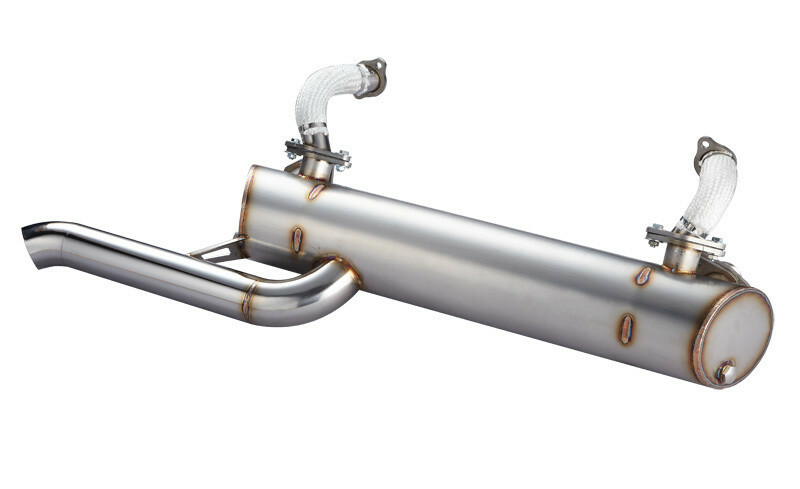 Hi Performance Stainless Steel Muffler for T2A & T2B Baywindow BUS with Type 1 Engine. 1. ± 4mm Adjustable flanges for stroker or narrower engines. 2. Muffler itself is about 20mm higher than engine rear support bar, #209 Tail pipe exit is about 18mm below rear bumper. 3. Sport muffler for engine up to 125 HP. 4. SuperFlow muffler for engine up to 150HP. 5. 100% #304 stainless steel muffler, tail pipes and headers. 6. Build in M18x1.5 nuts for Lamda sensor when tuning carburetors. 7. Fiberglass fire sleeve on #2 and #4 header pipes were designed to protect fresh air hoses. 8. Use original 111 298 051A gasket for heater box. 111 298 051A gasket sold separately.